A classroom website can be one of the best tools you can utilize to showcase the great things happening in your classroom. Some teachers already have a great class website or blog and today we are going to look at what you need to do to build classroom website of your own. 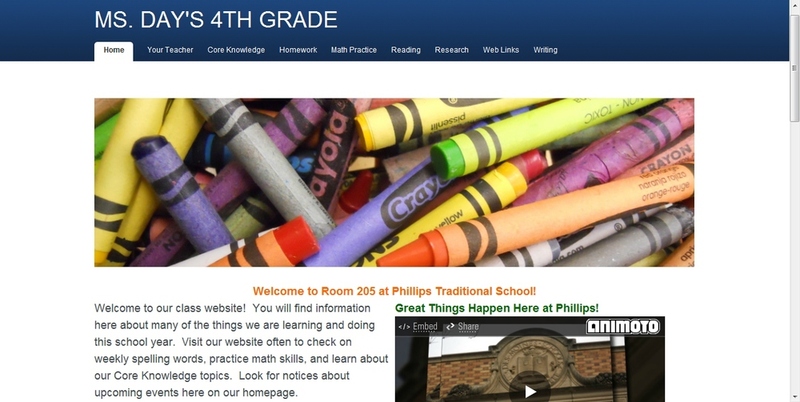 So what’s the difference between a classroom website and a classroom blog? A blog is like an online diary of articles and discussion topics that readers can subscribe and respond to. A traditional website is more so a repository of static content. Over the last few years these two areas have blurred into each other. Any web creation platform worth a pinch of salt will offer both of these options to you but a blog is probably going to be of far more use than a static site. What is the purpose of a classroom Blog? Always connected Learning: Your classroom website should allow students to contribute from home to a topic that has been discussed in the classroom. Alternately, you can include follow up content such as tutorial videos for students and parents who might need assistance in a specific area. Communication: In its simplest form a classroom website should be a bulletin board of news and events that are relevant to your class. A sense of pride: Your classroom website should be a great bragging point not only your students should feel proud of as it contains great examples of their work, but it should also serve as an excellent portfolio of your teaching craft should you apply for a promotion or another job. What it should not contain? Of course if you are intending to share your classroom with the world you need to provide and adhere to some cyber safety guidelines about not sharing personal information and always ensure you have parental permission. Never let your website become a platform for cyber bullying or criticism. Moderate it at least once a week. What is the best platform for success? There are literally hundreds of options here if you run a Google Search but here are my top three picks from personal experience. Weebly: Probably the web’s easiest blogging and website creation tool for beginners through to novices. It is free to get started but you can buy a full featured premium package for a few dollars per month. The great thing about Weebly is that allows you to create simple password protected pages that your students can feel a little safer on. Blogger. This is Google’s blogging platform tool and it is totally free. It will create a great classroom blog and that is about it. If you already have a Gmail account you are already registered. Simple drag and drop interface and can be integrated easily into your existing school website. Edublogs: If you are a WordPress user this will seem like the easiest thing in the world to you. If you are not I would not recommend starting here. I really only included because of the massive user base Wordpress has. If you get stuck on Blogger or Edublogs there is no 24/7 support to help you out but there are millions of users on forums who can help. Google has a number of web services and tools that offer a range of use to teachers. Here are five sites from the big G that you can use in you classroom today with some ideas to support them. Google Custom Search Engine: Create your own class custom search engine and tell Google which sites you want it to index, and you’ll be able to offer your students the best of the web. Ie: Create a science search engine inclusive of 10 of your favourite science sites. Google Book Search: Search from a mammoth selection of books ranging from popular best sellers to out-of-print books on Google’s Book Search. Google classroom posters: When you have exhausted our awesome collection of classroom posters then, help your students search the web better with these posters that contain tips for using Google Search and other Google products. Google classroom activities: Here, Google offers a small selection of activity ideas for primary school children. Google Maps: Get your class to use Google Maps to build maps of your community, learn about cities, and more and now you can even explore the great barrier reef with street view too. Please be sure to let us know about another great Google sites or tools you might use too. With the announcement of the 2011 Edublog Award winners, there are now two more award-winning wikis in the Wikispaces community. And we couldn’t be prouder! First place for the 2011 Best Educational Wiki went to Martin Burrett for his ICTmagic wiki. It’s a truly inspiring collection of IT resources for students and teachers, and it’s sure to give you more ideas than you could possibly have time to try. ICTmagic was also our Featured Wiki last August, so you can read more about it in Martin’s own words. Second place went to Robert Maloy of the University of Massachusetts Amherst. His Resources for History Teachers began as part of a class in 2006. Then, in the best tradition of all great wikis, it grew through the combined efforts of Professor Maloy’s students, along with K–12 educators and students from around the world, into a rich, multimedia, cross-referenced sourcebook for anyone interested in teaching or learning about history. We were also very excited to see that many of the people we have previously profiled on this blog were nominated for Edublog Awards, including Andrew Churches of the Educational Origami wiki, Gwyneth Jones of the Daring Librarian wiki, Shawn Avery of the Student Math Movies wiki, and Craig Kemp of the Ruma Tahi wiki. And congratulations to Linda Yollis, winner of the Most Influential Blog Post award, whose Educational Blogging wiki we featured in November. In fact, we want to extend our heartfelt congratulations to all the Edublog winners and nominees, across all the categories. The amazing educational content you are constantly creating and sharing all over the Web makes our work more satisfying, and inspires endless conversations around the office. Be sure to check out all the winners and nominees for yourself. We are looking for the best school website in the world. Yes Numero Uno: If you have seen an amazing school website that is innovative and has some great resources for teachers, parents and students. Oh Yeah! It might need to look cool too. Then we need to know about it. We are looking for nominations between now and the end of September. And then passing the voting out our readers to identify the winner of the Inaugural World's Greatest School Website Award. A brand new website for your school valued @ $550 or if you want to be greedy alternately you can have A professional Blog / Website of your own valued @ $550. We must thank Belinda @ TechZoo for this great prize ( Who make some awesome school sites themselves. ) Which will be Drawn in October. Some runners up mystery prizes will be on offer that we will announce soon. Sooo... Post your nominations in the comment space below and check back regularly as we will be posting many of these great sites up over the next few weeks. Nominations close September 30. Don't Miss out! Recently Belinda from TechZoo updated our school website and she has designed a number of school web sites for schools around the world. We were having a discussion about the must haves on a school website and these were the 5 essentials we thought every school website should have. 1: Welcoming and Friendly Design: Ultra cool should not be your aim on a school website. Prospective parents and students want to feel a welcoming and friendly vibe - bright colours and lots of photos of opens spaces and happy students. First impressions last. Certainly an ugly cheap looking front page website will do you just as much harm if not more. 2: Current and Up-to Date info: If your last newsletter was posted when Noah built an Ark or the canteen list is out of date visitors will instantly gain a sense of neglect and mismanagement. Remember a website today is your schools biggest marketing tool. 3: Who is who? Don't go overboard here - Who is your principal? And what are their thoughts? Maybe a group photo of your staff and any other major roles that parents will regularly want to contact beyond their child's classroom teacher. 4: Classroom Blogs: Any web designer worth a pinch of salt should be able to set up simple blogs for areas of the school that want them. Prospective Parents really get a feel for what is happening at the coal face from these. Especially if there is some stuff there from students. 5: Good Photo's: I can't believe schools invest tens of thousands on resources and can't get a decent digital SLR to take photos that look as great on a website as they do in reality. Finally make sure your school has easy to find contact info and maps. If you follow these guidelines you should have yourself a pretty good website and don't hesitate to contact Belinda if your school needs a cheap and effective website. It's what she does for a living. There are plenty of math sites out on the web that target to different audiences and needs but it is always difficult to find sites that you can just freely let your kids roam and and explore and learn something at the same time. The list I have put together below are 5 great sites that I can confidently recommend to use in your classroom or at home to have some fun and extend their knowledge. Kids who love cats will enjoy exploring this site. Learn exactly how old you are in days, minutes and even seconds. Games include multiplication grids, using money, and guessing how many people there are in What a Crowd! Includes an interesting collection of math, logic, and language puzzles, games, and illusions, separated into easy, medium and hard categories. You've won a one-way ticket to the Planet Knab, but once you're there, you find that it isn't what you thought it would be. Get a good job, make wise financial decisions, and save enough to pay for the next rocket ship to Earth, or you might just be stuck on Knab forever! www.funbrain.com/numbers.html. This site includes 17 original games based on soccer, car racing and much more Other games include Math Baseball, where a child can score runs with correct answers and Operation Order, where students can build pyramids with their knowledge of algebra. ﻿ Your kids will love exploring the numerous scientific simulations located here. There are a range of simulations fro all fields of science.